Info-Maison Bardagi.com/3129 Located on a quiet street, this bright unit is on the last floor of a beautiful building in the heart of Plateau Mont-Royal. 96 Walk Score, steps from Sir-Wilfrid-Laurier Park and shops & restaurants of Laurier East Avenue. Spacious open space, 2 bedrooms and rooftop terrace possibility. A must see! Third floor: Spacious open space with living room, dining room and kitchen. Master bedroom with walk-in and laundry room access. Second bedroom with closet and balcony. Family bathroom. Sunny terrace. 9'5'' ceilings. 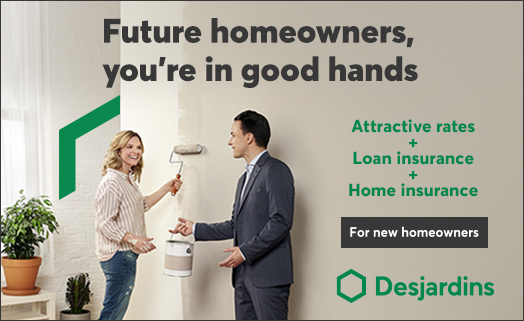 The institution for the mortgage financing will be Caisse Populaire Desjardins Immaculée-Conception. Taxes and insurance are calculated based on the part of the unit (14%). Please note that the part of the unit for other common expenses is 16%. Net living area of 92.7 square meters as indicated in the certificate of location. Right of first refusal: A co-owner seller should submit any bid accepted to the other owners, which shall have a period of 48 hours to notify the owner seller of their intention to acquire its share in the same prices, terms and conditions as those contained in the accepted offer, otherwise, the seller owner can comply with the accepted offer. All light fixtures, microwave hood, dishwasher, stove, refrigerator, wall mounted heat pump, walk-in fixtures, laundry room shelves. All of the above are included without warranty of quality. Kitchen stained glass, rods, curtains, washer, dryer.